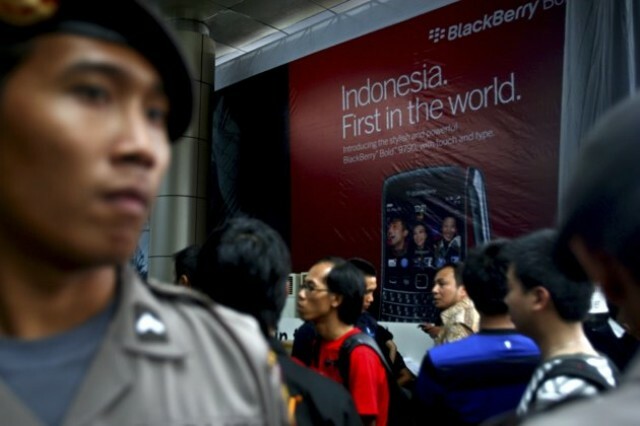 Riot police were dispatched on Friday as the BlackBerry Bold 9790 went on sale in Indonesia. The handset, which retails for $540, was being sold at half price to the first 1000 buyers. As a result, fights and scuffles broke out as rumours circulated the phone had sold-out. Buyers lined up on Thursday night for the new phone which is one of the most anticipated devices of the year in Indonesia. The country of 240 million has one of the world’s fastest smartphone adoption rates, with RIM’s BlackBerry leading the pack. There are currently 6 million BlackBerry devices in Indonesia, and the country is the first in the world to sell the new device.